The recipe is actually pretty precise and simple, and suitable for a perfect tea cake. You could have it without the compote too, but i like to dress my cakes up and with the juiciest of plums and cherries in season, I really didn’t need a second thought. 1. Pre heat the oven to 200 degree Centigrade. Line a baking pan with butter and flour and keep it aside. 2. In a deep bowl, sieve together the flours, baking powder, cinnamon powder and set aside. 3. In another deep bowl, beat the butter, cream cheese and lemon together till it is light and fluffy. Beat in the almond essence and palm sugar. When it is well mixed add the eggs one at a time and fluff them up. 4. Now divide the flour into 3 parts and add them one by one to the egg and cream cheese mix, ensuring you use a spatula to fold the flour in. Use the ‘figure 4’ movement to do this. 5. Once all the flour has been incorporated, pour the batter into the ready baking pan and smooth the top with a spatula. 6. Place the cake in the oven to bake. 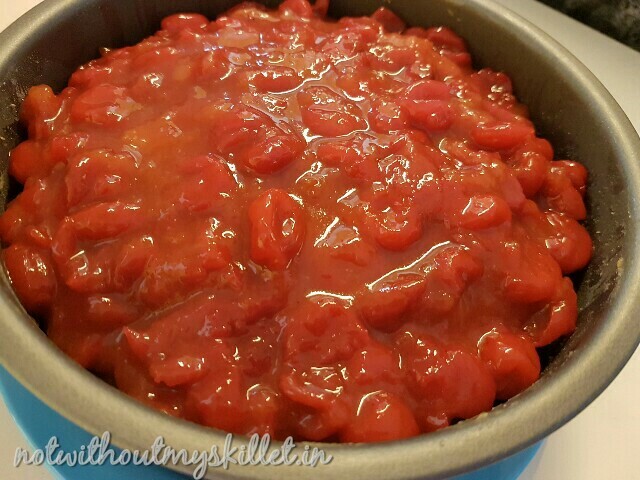 Rotate the pan at 15 minutes to ensure the top browns evenly. 7. Bake for 30 minutes or until the cake is done. Insert a skewer into the centre at 25 minutes to check if the cake is done. If not, give it another 5 minutes. 8. 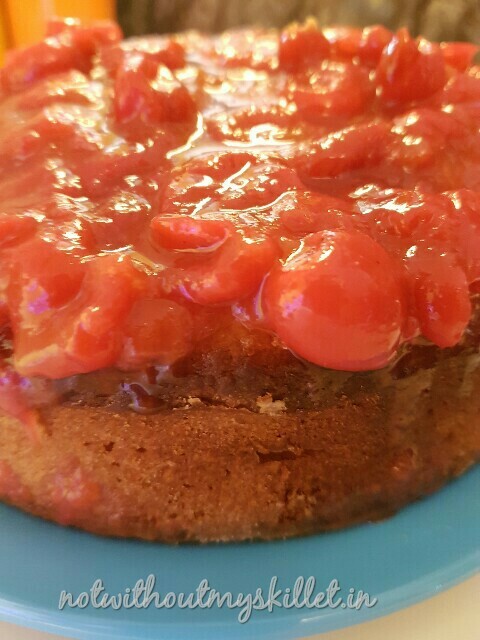 The cake top may crack while baking, but that’s ok. Once you pour the compote on it, it wont be visible. 9. Let the cake cool. In a skillet warm the tablespoon of butter. 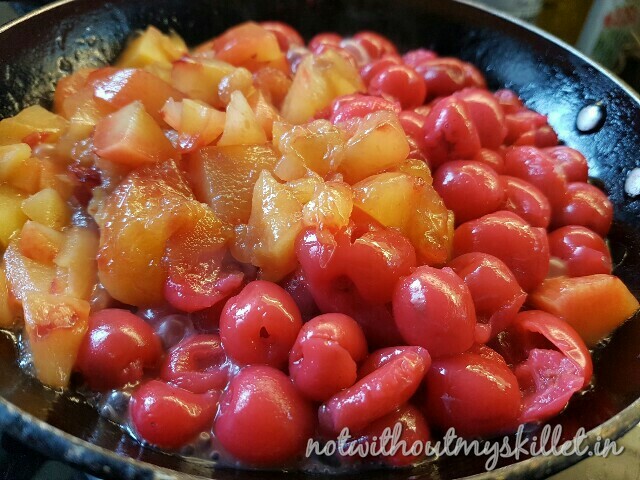 Add the pitted cherries and chopped plums and 200 grams of sugar cook for a good 20 minutes till you have a jammy consistency. Let cool. 1. 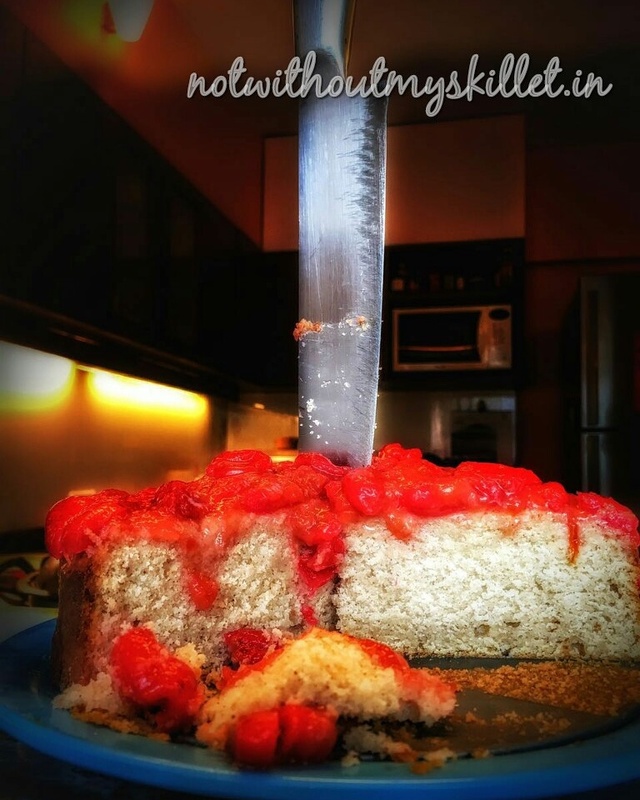 When the cake is cool, take a long skewer and make holes right across the cake. Pour the fruit liqueur all over the cake. I’ve used a passion fruit liqueur. 2. Now top with the cherry and plum compote and serve. 3. You can add a dollop of cream while serving. If you refrigerate the cake, remember to bring it down to room temperature before consuming it.